The Red Pyramid is commonly known as the Shinning or the Northern Pyramid and it has the second largest base of any pyramid in Egypt, each side measures about 220 m. It is considered the largest of the three major pyramids located at the Dahshur necropolis 40 km outside Cairo near Saqqara. It was built from red limestone. Surprisingly, the pyramid is considered the third largest pyramid in Cairo after the great pyramid of Khufu and the pyramid of Khafre. The Red Pyramid used to be cased with white Tura limestone, not red ones, but only a few of these stones now remain at the pyramid’s base. During the Middle Ages, much of the white Tura limestone was taken for buildings in Cairo, which revealed the red limestone beneath. It is built with about 160 layers of stone. It can be fully accessed in addition to the chance to see the burial chamber inside. The truly astonishing fact about the Red Pyramid is that Snefru “The father of Khufu”. It was the third pyramid to be built during the old kingdom. The construction of this terrific pyramid is believed to be started during the thirties year from the reign of Snefru. It took about 17 years to be built. The construction of such a complex was the result of the crises which have been experienced during the construction of the first two pyramids by Snefru. Those Pyramids were the Pyramid at Medium, which collapsed in antiquity, and the second one was the Bent Pyramid that had the angle of its inclination dramatically altered from 54 to 43 degrees part-way through construction. The height of the pyramid is about 105 meters and it has been uncovered & reconstructed and is now on display at Dahshur. It is an attractive site because of its close location from the army camp. In order to reach the pyramid, tourists have to climb steps built over the stones of the pyramid. Then they go through a passage that is about 4 feet wide and 3 feet in height. This passage leads into a chamber whose corbelled roof is 40 feet (12 m) high and rises in eleven steps. There is another room inside the pyramid that is reached by a large wooden staircase built for the convenience of tourists. There is also a third chamber with a corbelled roof 50 feet and it is very rough and sunk below the level of the access passage. 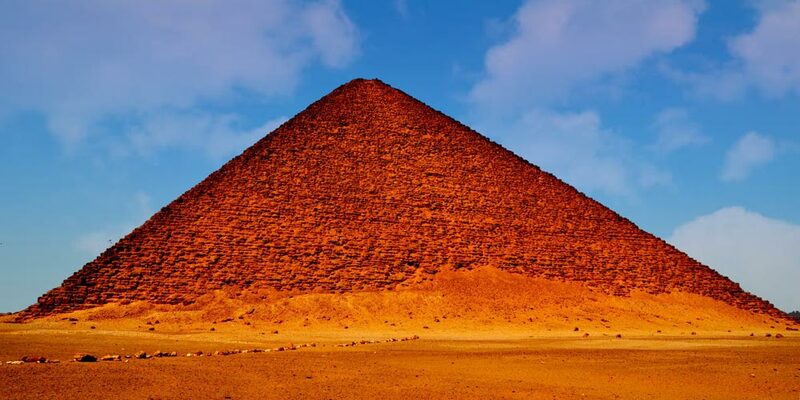 Why you should visit the Red Pyramid!! You can walk around the complex in peace and quiet and you will take terrific photos inside & outside. There isn’t an extra charge to enter the pyramid. The craftsmanship inside the pyramid is astonishing and it makes anyone wonders how anyone could have put together these stone blocks to make such a smooth ceiling perfectly measured and polished. As you crawl through its tunnels in solitude, smell the dank interior and imagine what it must have been like for the first explorers, you’ll feel that you are so close from achieving your dreams to be a great adventurer. You can also discover the other attractions of Pharaohs by checking our Egypt tour packages and book a tour to enjoy all the best of Egypt has to offer in Cairo, Luxor & Aswan.